Sarasota residents get ready to rumble by casting their first impression votes for or against the motion. 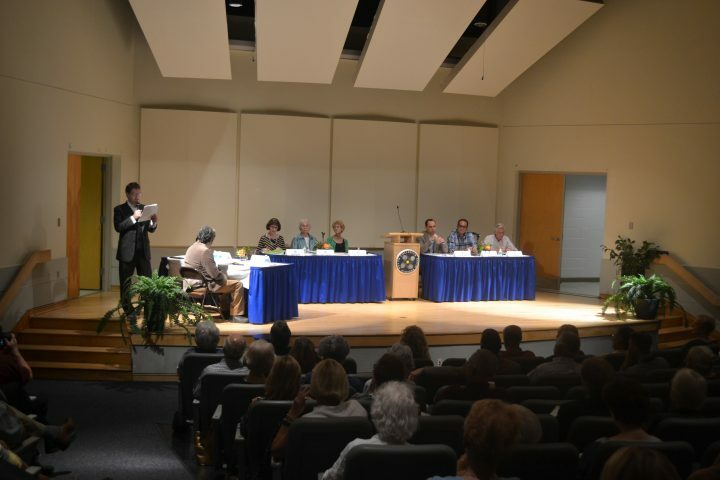 “Both sides will educate us as much as the seek to sway us, let this good natured fight to the death begin,” SRQ Magazine publisher Wes Roberts said humorously as an audience of Sarasota community members anticipated a spirited debate regarding the motion that public hearings ought to be held for large scale development projects in the city. 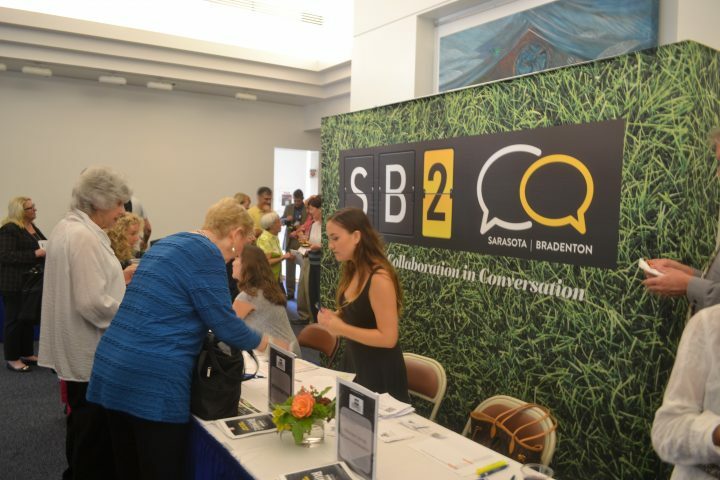 This debate took place at SRQ Magazine’s SB2 Rumble-Sarasota, How Does Your City Grow? event in the Mildred Sainer Auditorium. The “for” panel consisted of three members of Sarasota’s STOP! Steering Committee, dedicated to the town’s growth issues. The “against” panel included the President and CEO of the Greater Sarasota Chamber of Commerce and members of the private development sector that argued that the public already has more constructive opportunities to make their opinions known during the development process. 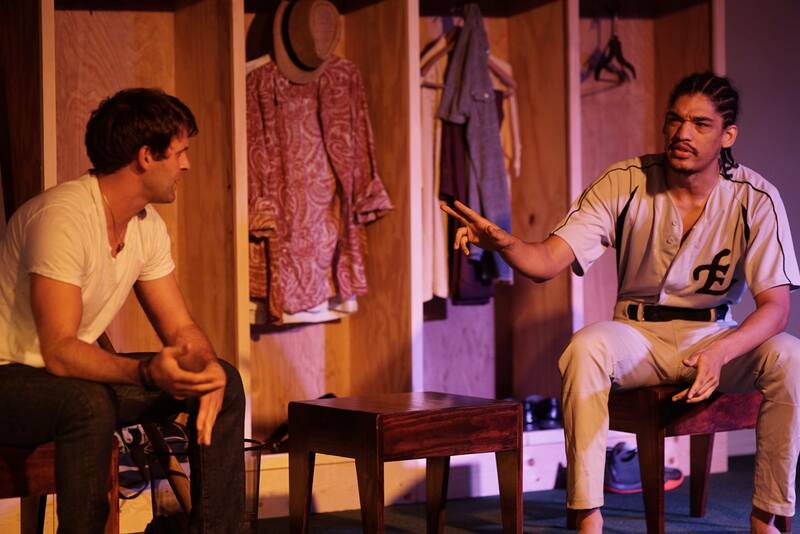 The process of “The Rumble” involved each audience member casting a vote for or against the motion prior to hearing each informed argument of the panel speakers, and then casting a vote following the discussion to determine which side “swayed” the most votes. The winning side was determined not by the amount of people supporting it, but rather by the amount of people swayed to the other side through comparison of the votes before and after the forum. On the side of the motion was Mollie Cardamone, former mayor of Sarasota and STOP! Steering Committee member, STOP! Steering Committee member Kate Lowman and Eileen Normile STOP! Steering Committee Member and former City Commissioner. Opposing the motion was Kevin Cooper, President and CEO of the Greater Sarasota Chamber of Commerce, Chris Gallagher, partner at HOYT Architects and Javi Suarez of Apex-Studio Suarez. Each panelist notably had personal stakes in their argument. The essence of the argument against the motion was that all of the buildings are built to code and that citizens have input on what goes into the building codes that, granted, have not been updated for 15 years. Apart from that, Cooper made clear that people can email the Chamber of Commerce and have much longer, individual meetings with developers to voice their concerns. The issue that the “for” panel took with the lack of public hearings in the current process is that public hearings would better be able to set convenience details into stone, whereas individual meetings did not guarantee any influence over development plans. 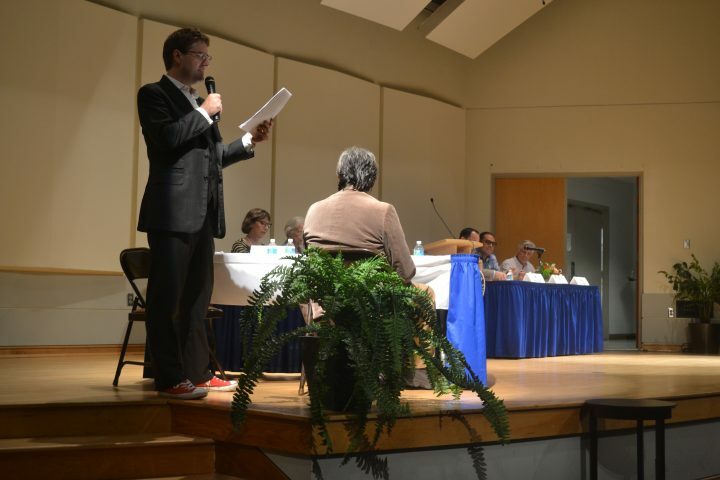 Prior to hearing the debate, a few Sarasota residents weighed in on their initial opinions on the motion. “I hate what is happening to Sarasota, it is very sad,” Mat McCulloch, a member of the STOP! Advisory Committee, said. “Growth is not negative, it just needs regulation,” Ron Cardamone said, husband to “for” panel speaker Mollie C. Cardamone. “Who is making these decisions?” Donna Turner inquired about growth in Sarasota. Out of everyone the Catalyst spoke with, there was notably no one siding against the motion before entering into the Rumble. Following the debate, audience members had a chance to voice their concerns regarding the issue to the panel speakers directly. The results reflected that prior to the debate 72 percent of voters were for the motion that public hearings should be a part of the development process, 28 percent were against the motion and eight total voters were undecided. At the end of the debate, the “for” panel had swayed 5 percent of the voters to their side, as opposed to the 3 percent of the voters that the “against” panel swayed, so victory went to the “for” panel. SRQ Magazine recently started “The Rumble,” only having held one previously on how Sarasota has failed young professionals. “The Rumble” is a modified Oxford- style debate that invited panels representing each side to answer a series of questions posed by moderators Jacob Ogles and Wes Roberts for two minutes, followed by a one minute rebuttal from the opposing side. When the moderators finished their round of questions, they invited audience members to come forward and ask any questions they may have formed during the debate. “The Rumble was launched as my baby from SRQ magazine. As a magazine one of our missions is to give voice to a variety of voices,” Wes Roberts said in an interview with the Catalyst. When asked about the mission behind the Rumble, Roberts said, “It is our feeling that when people have all sorts of opinions and one of the best ways to value them is to give them light, this [the Rumble] is that [mission] in physical form… The goal of this is to remind people that you can have debates and they can be civil and constructive, that you can disagree and respect each other. Throughout The Rumble, SRQ Magazine hoped that everyone would walk out with a deeper understanding of the issue. The buzz of excited conversation about development as people filed out of the Mildred Sainer Auditorium indicated that this goal was achieved.